Several years ago, I found myself buying new meters even though I had a box full of mystery meters with calibrations such as “Tune for Max”, “Low, Medium, High”, etc. These “mystery meters” were in perfectly good working order, and I could easily find the current required for full scale deflection with a simple workbench jig, but I needed to know their internal resistance in order to calculate the value for shunt resistors, so I developed a device I named “The Meter Master”. Nowadays, I seldom use the Meter Master, but I keep it handy, just in case. 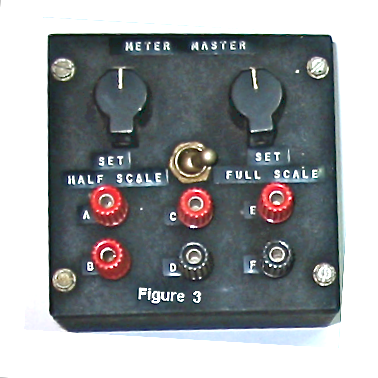 The Meter Master is a simple device that is used along with a DMM ( or VOM ) to determine the characteristics of unknown analog meter movements. These days, voltage and current read-out devices have gone digital, but there are still lots of old analog meters around that will do the job nicely. For many applications, I still prefer the analog meters. Many times, old (or new) analog meters, can be had for the asking, or at very reasonable prices, at Ham club meetings and Hamfests. The idea is to salvage meters with unknown characteristics and turn them into useful instruments. You must know two things about the movement in order to exploit it’s potential as a useful instrument. The amount of current required for full-scale deflection. The internal resistance of the meter. No, you can NOT simply measure the internal resistance with you DMM. Analog meters come in a variety of shapes and sizes, as shown in the photo at the top of this page. If you are lucky, your meter will be calibrated. Perhaps it reads 0 to 100 microamps (uA), or some such. This is great if you want to measure current that ranges from zero to about one hundred uA, but suppose you want to measure up to a couple of Amps? Better yet, suppose you want to use your meter to measure both current and voltage? How in the world do you do that?! This is where the Meter Master earns it’s keep. The circuit for the Meter Master is shown below. I built my Meter Master using (mostly) parts from my junk box, except for the “box to put it in”, which is a Bud Utility Cabinet that measures 4″ x 4″ x 2″ as shown below. I know, I KNOW! It’s ugly as sin, but black crinkle was all the rage back in 1963 when I built it. If your local library has access to old Ham radio magazines, you can find my original article about the Meter Master in the August, 1964 issue of CQ magazine. I used three-way banana jack binding posts at A through F. The two potentiometers, R1 and R2 are ones that just happened to be in my junk box at the time. Potentiometers with similar values can be substituted, and linear pots are best. For the battery, I used a couple of AAA batteries in a Radio Shack #270-398 holder that was salvaged from a previous project. It takes longer to tell how to use the Meter Master than to actually perform measurements with it. Once you have been through the process a couple of times, it only takes a couple of minutes to investigate a meter’s characteristics. Let’s assume that you know absolutely nothing about your “unknown” meter. Connect the unknown meter between “C” and “D”, with the positive lead connected to “C”. Set S1 to Full Scale. Set R1 to maximum resistance. I have maximum when the control is fully Clockwise, but the direction of travel is arbitrary and unimportant. The important thing is to be sure it is set for maximum resistance (MINIMUM CURRENT) to start the test. Insert a DMM (or VOM) with positive lead to “B” and negative lead to “A”. Set the DMM to read 200 mA, or more. Always start with a high current setting on your DMM and work down. Adjust R1 to obtain a full scale reading on the unknown meter. If a full-scale reading cannot be obtained with R1set for minimum resistance, the unknown meter is beyond the current supplying capabilities of the batteries. Is such an event, disconnect the DMM quickly to prevent draining your batteries. This condition is probably due to an internal shunt in the meter, and can be overcome by opening the meter case and removing the shunt. If the meter case is manufactured in such a way that it can not be opened without destroying the meter, throw the meter into the trash now and save yourself some aggravation. Assuming the meter salvageable, let us continue . . . If you have a full-scale deflection on the unknown meter, but there is little or no reading on your DMM, set the DMM switch to read less and less current until you get a reading for the current. Whatever current you read on your DMM is the full scale deflection current of your unknown meter (which is now much less unknown than it was just a few moments ago). Let’s assume your meter has a full deflection current of 200 uA. Increase R1 until you get a reading approximately ¾ full scale, then disconnect the DMM. Replace the DMM with a jumper between “A” and “B”. Re-adjust R1 for a full scale reading. Set S1 to “Half Scale” and adjust R2 for a half scale reading. Set S1 back to “Full Scale”, and read the internal resistance between “E” and “F”. For this example, assume the internal resistance is 200 Ohms. Your “unknown” meter is now very much known. You can use the meter to measure current you are likely to encounter with your electronic tinkering. If you want to measure current that is above the capability of the meter . . .
. . . simply place a SHUNT RESISTOR across the meter terminals so that part of the current goes through the meter and part of the current goes through the shunt resistor. The shunt resistance is calculated using the formula shown here. When you crank the arithmetic to find the value for your shunt resistor, you will get a very small number – – in this example, 0.02 Ohm. There are commercial suppliers for resistors with values below 0.1 Ohm, and these resistors are very expensive. The best solution is to make your own, and here’s how . . .
Small value resistors can be easily made using ordinary enameled copper wire. The photo below shows a shunt resistor across the terminals of a meter. NOTE: The shunt resistor assembly shown in the photo is NOT the 0.02 Ohm resistor being discussed in the text. The photo simply illustrates the technique. The shunt resistor shown in the photo was fabricated using #22 enameled wire, wound on a 100 Megohm, 2W resistor. (A resistor of any value of 10 Megohms, or more will do. ) A resistor of such high resistance serves nicely as a form for a shunt because virtually ZERO current flows through the resistor, and virtually all the current flows through the wire. For practical purposed, the resistor serves as an insulator. Other insulating material, such as a wooden matchstick, can serve as a for form on which a wire shunt resistor can be wound. Tables in the ARRL Handbook (and other electronics handbooks) show the resistance of various sizes of copper wire. You can use these tables to calculate how much wire is required to make a 0.02 Ohm (or any other fractional value) resistor. Your first task, however, is to identify the minimum size wire that can be used for the shunt. In the example being used here, the shunt will be carrying virtually all of the current (about 1.9998 Amps) so the wire you choose must be capable of carrying about 2 Amps. Looking at the wire tables in your Handbook you will find that #20 wire will do the trick. The ARRL Handbook chart says that #20 wire will carry only about 1.5 Amps, but that rating is for continuous duty. Notice that #20 wire is listed at 1,022 circular mils. 500 circular mils per Amp is commonly used for all but the most demanding applications, so we are OK. When you do the arithmetic, you will find that we need about two feet of #20 wire to make the shunt resistor. That is quite a bit of wire to hang on the back of a meter, but by winding it on a small diameter insulator, such as a wooden matchstick or a high value resistor, it will be no larger than a 2W resistor. Since I almost always use salvaged wire, I’m never quite sure of the gauge, so I seldom use the charts and tables when calculating how much wire is required for a given application. First I choose wire that I judge will carry the required current, and try to err on the hefty side. The judgment comes from experience; I know of no other way to get it. Once the wire is chosen, I cut EXACTLY 10 feet, plus about 1/4 inch, then strip about 1/8 inch of enamel from both ends. Next, I carefully measure the resistance of the 10 feet of wire. Dividing by ten gives the resistance per foot – – then the calculations are the same as when using the tables in the handbook. After the wire is cut to yield the required resistance, I wind it on a piece of wooden match stick,or other suitable insulator material, leaving a little extra on each end for making connections. What I have just described is the simplest form of shunt resistor, and it works in many applications. 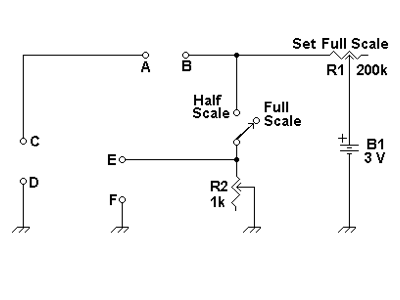 For some applications, however, it is difficult to use a simple shunt to multiply the scale of your meter movement. In these instances, you will use a shunt plus a multiplier resistor, as shown below. I avoid writing about electronics theory every chance I get, but there are times when a little theory helps with understanding what’s going on. This is one of those times. The Meter Master, and meters in general, are really nothing more (and nothing less) than a practical application of Ohm’s Law. George Simon Ohm, by the way, was born in Erlingen, Bavaria in 1789 and died in 1854. In 1826, he published a paper entitled “Determination of the Law According to Which Galvanometers Conduct Contact-Electricity”, later to be known simply as “Ohm’s Law”. Ohm’s Law is an elegant definition of electromotive potential (Volts), the flow of electrical current (Amperes), and resistance (Ohms). Andre-Marie Ampere, for whom the Ampere was named, was born in Lyons, France in 1775 and died in 1836. Andre did lots of work with electromagnetism, and other interesting stuff. Alessandro Volta (yes, that’s where the volt got it’s name) was born in Come, Italy in 1745 and died in 1827. Alessandro invented the first sustained source of electric power, the voltaic pile, now commonly called a battery. The very first battery cell was a frog leg on an iron table. When a copper hook was connected to the end of a nerve, the frog leg would “jump”. Volta first thought the electricity was being produced in the frog’s leg and named it “animal electricity”. Further experiments showed the electricity to be produced by chemical (ionic) action with two dissimilar metals (iron and copper, in this case). As you can see by the dates of these men’s lifetimes, shown above, tinkerers have been fooling around with electricity for a long time. That concludes the theoretical discussion regarding Ohm’s Law. Thanks to George Ohm, we know that the three fundamental units of electricity, voltage, current, and resistance, cannot be measured independently because they are each used to define the other two. To put it another way, if you know two of the three, you can find the other one. The 200 micro-Amp meter being used in this example can measuring voltage, but not very much. The actual amount at full deflection is: the full-scale current (0.0002 Amp) times the internal resistance (200 Ohms), which amounts to 0.04 volts. Knowing this, you can use a MULTIPLIER RESISTOR to measure the voltage drop across a shunt resistor placed in the current path, as shown (again) here . . . When current flows through the shunt resistor, a voltage will develop across the shunt resistor. For example, if the shunt resistor is one Ohm and two Amps flow through it, you would find two volts. This is far too much voltage for a meter capable of measuring only 0.04 volts. This means you must “drop” 1.96 volts. Since the meter being used in this example deflects full scale at 0.0002 Amps, Ohm’s law tells us that the multiplier resistor must be the voltage (1.96) divided by the current (0.0002 A) which equals 9,800 Ohms. Transforming a meter into a voltmeter is done by simply choosing the proper Shunt resister and a proper Multiplier resistor. See how easy this is! We’re on a roll, so let’s keep going! Suppose you want to measure up to 20 volts with the same meter. The value of the multiplier resistor is equal to volts (20) divided by the current being shown on the meter (0.0002 Amps) which equals 100,000 Ohms. If you want to measure up to 200 volts, the multiplier resistor is 1 Megohm. That’s how you build volt meters. If your junk box contains “mystery” meters, why not build your own version of the Meter Master and put those old meters to work? This entry was posted in current, meter master, multiplier resistor, shunt resistor, voltage and tagged analog meters, Calibration, DIY Tools, Meter Master, Multimeter. Bookmark the permalink. Thanks for dropping by and leaving a comment. I am pleased that you found something of interest. Your web site offered us with useful information to work on. You’ve performed a formidable activity and our entire community will probably be thankful to you. Best of luck with your community project. Happy you have found something here that will be of interest to your brother. Good luck to both. on web I found this web page as a best website for most up-to-date updates. Thank you for your interest and your comment. Other priorities demand my attention from time to time, but I try to keep my blog posts up to date whenever possible. I’ve been neglecting the Ham Radio (technical stuff) on this blog for quite a while. I have a few electronic posts “in the works”, but distractions of various kinds keep coming up to demand my time and energy. Undeniably imagine that which you stated. Your favorite reason seemed to be on the net the simplest factor to understand of. I say to you, I definitely get irked while other people consider worries that they just do not understand about. There is no “Part 2” in the works. What would you like to see in Part 2 ? It is nice seeing some positive news on here regarding FXCM. Thanks for stopping by and leaving a comment, but I have no idea what FVCM relates to.